The workshop aimed to (1) Prepare and familialise the coordinating teachers and students with the online technology training platform, and trends of technologies for improving the capacity of schools, teachers and students; (2) Enhance the understanding on the “Smart School” concept and implementation for teachers and students; (3) Provide basic knowledge on “Augmented Reality (AR)” and how to apply AR for developing learning and teaching resources by students and teachers; and (4) Train the teachers and students to handle the WebEx teleconference system for the future participation in the SEAMEO’s online programmes. The workshop had three sessions. The first session was about WebEx training technology and how to proceed online registration. 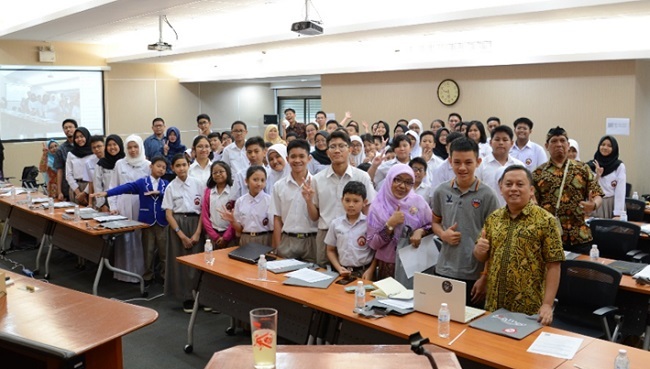 The second session was focused on the implementation of technologies for smart schools, smart teachers and smart students, and also the familiarization of SEAMEO programs, such as SEA Creative Camp, SEAMEO Lecture Series, and pilot project Story Telling. In the last session, students were trained about the basic Augmented Reality and practiced with their own notebook/laptop. Meanwhile, the teachers were trained about basic Smart School.